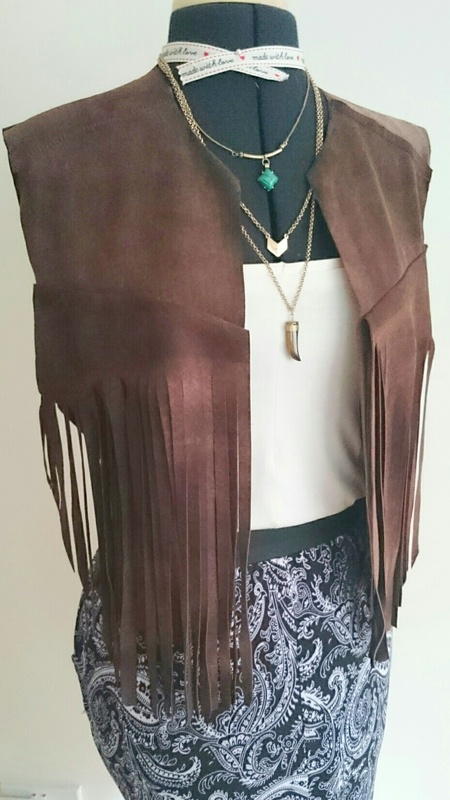 To me, nothing says carefree, summer and relaxed better than a little fringe, lace and leather. I love the Boho Chic look and these talented Refashion Runway women took this look to a whole new level this week. Enjoy! And be sure to vote for your favorite at the bottom of this post. 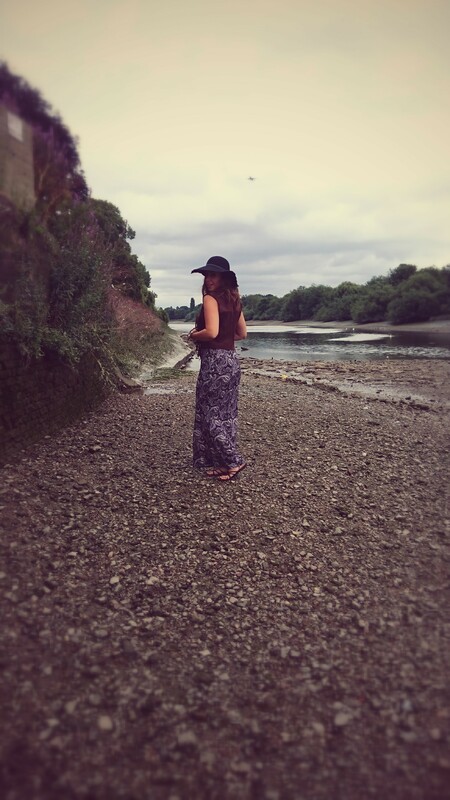 to see everyone’s Boho Chic creations… can’t wait! on my own blog) – otherwise you’ll fall asleep by the end of it! 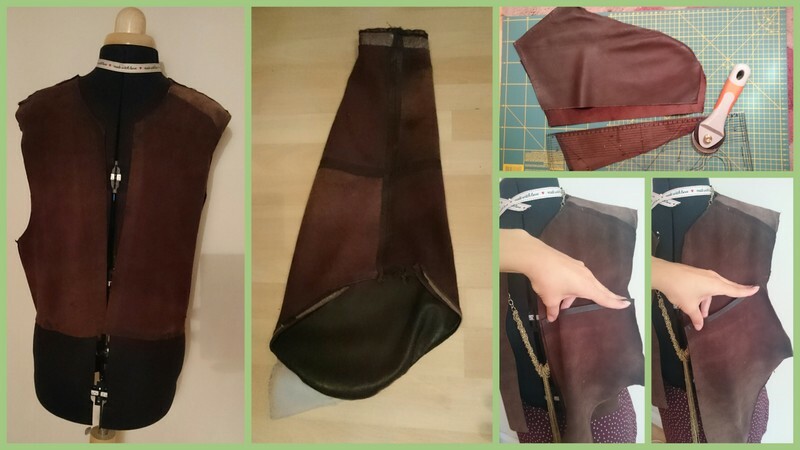 the front seam open half-way to create a front slit. the drizzle it was pretty dark – hope you can see! Here’s one of the front of the skirt! And here’s a close-up on Dolly, for a better look at the waistcoat! where I found, oddly enough, a bathrobe. The second thing I noticed after the texture was the logo that read, ” Crozer Cancer Center.” That’s when I realized that this robe had a story to tell too. A story of hardship and illness. And that’s when I got my idea: I wanted to give this robe a second chance. Instead of representing a devastating illness, it would represent a second chance. so did the robe. So it was a match made in heaven. occasions. Anyone can buy them on Amazon. 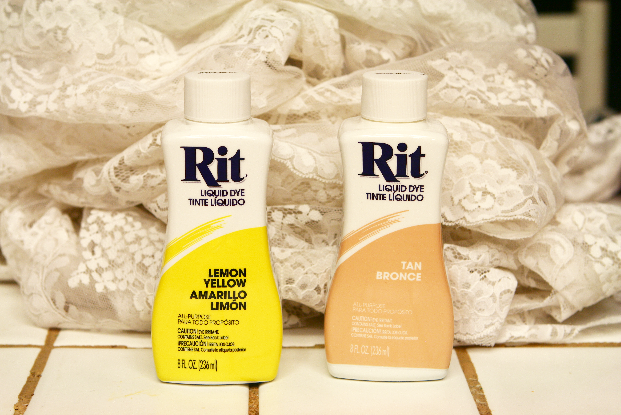 make it feel more Bohemian. used the fabric leftover from the top to make a headband. easier! So, I found some blue scrap crochet material and sewed it over the back yoke. It was pure luck that the crochet matched one of the embroidery colors! I thought the green, yellow, and turquoise were pretty together so that was my inspiration for the colors of my decorative stitching. 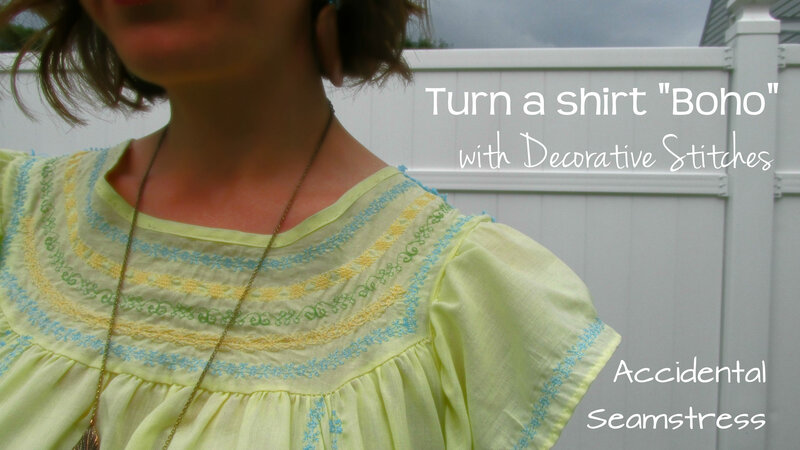 Starting with turquoise thread, I began by sewing around the neckline and arm holes. 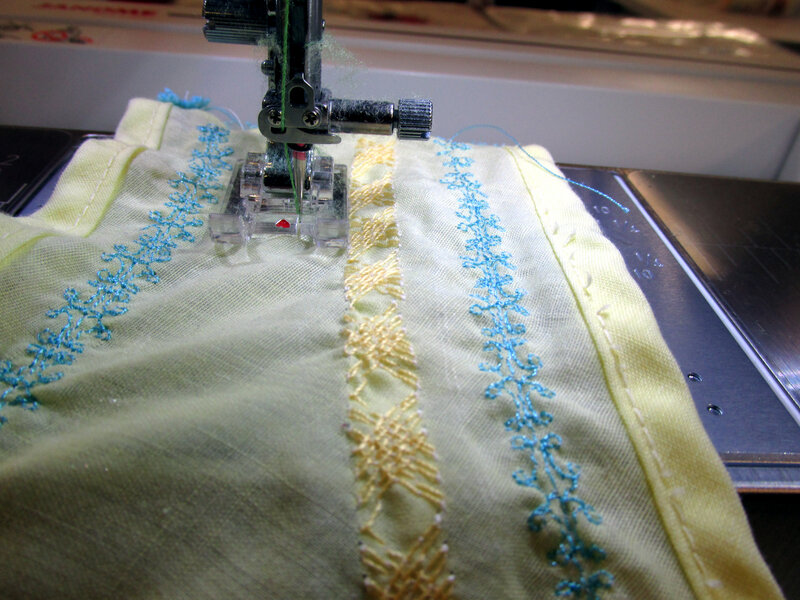 I chose a different stitch and sewed a line next to it with yellow thread, and then green. I kept repeating this until the entire front yoke was stitched. 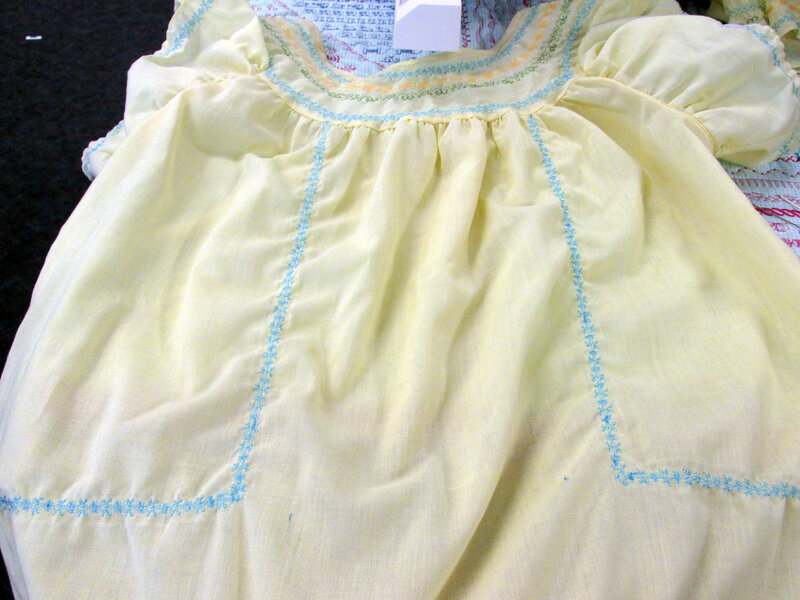 At the bottom hem of the shirt, I stuck with with blue thread only as I thought it would translate better in photos. 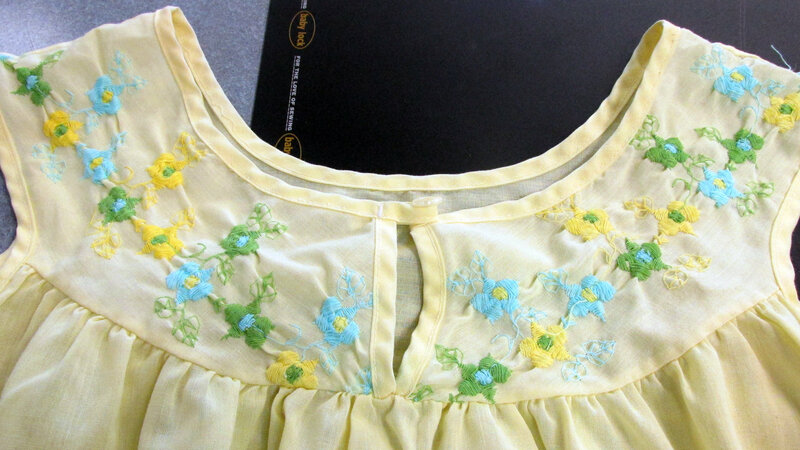 Then, I decided to go for broke, and sew some of the decorative stitching down the front of my shirt. 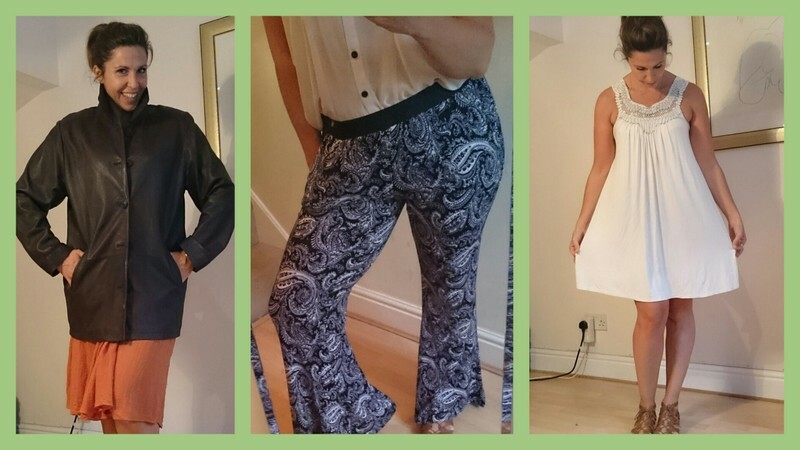 I measured and marked and went for it… and I loved it! stitching to the sleeve as well. 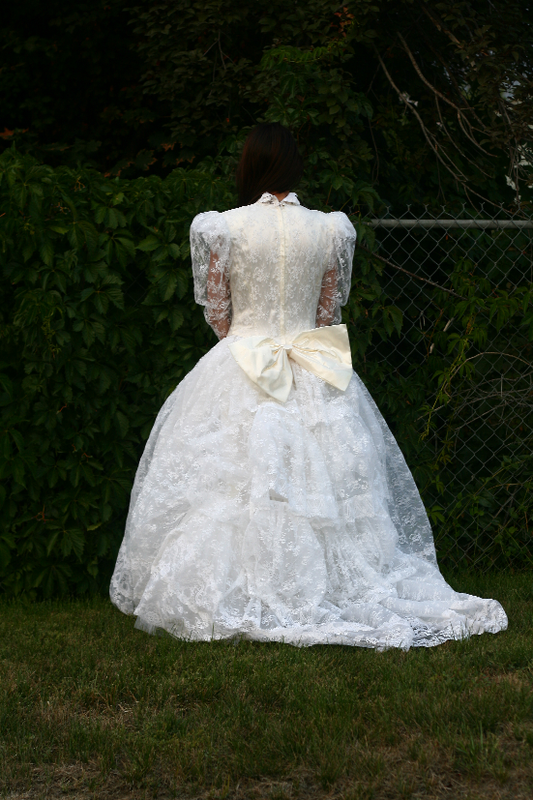 “I found this gorgeous wedding dress at a thrift store. 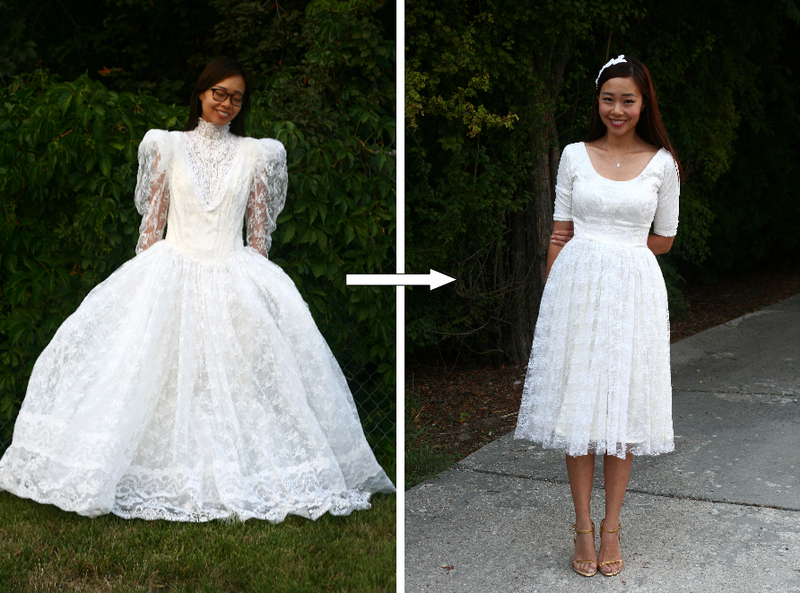 Sure, it’s outdated and not within the time of what’s in style right now, but I can see why a certain lovely bride fell in love with this dress and wore it to her wedding! I am sure she looked absolutely stunning in this dress and I felt a little bad(?) as I cut into this dress and made it into something different. 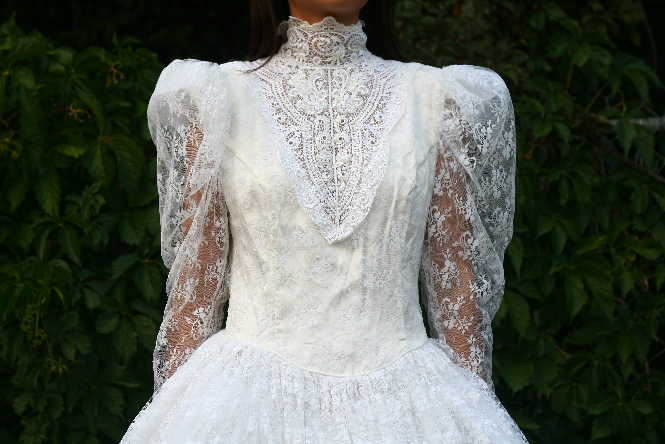 As I was cutting the endless about of tulle, shoulder pads, giant bow, lace trimmings, lace, and more tulle, I thought of the lady that wore this dress to her wedding. I wish I could meet her so I could see pictures of her in this dress on her wedding day! This is the kind of dress I would have fell in love with back in the day, it’s so fancy and elegant and princess-y. 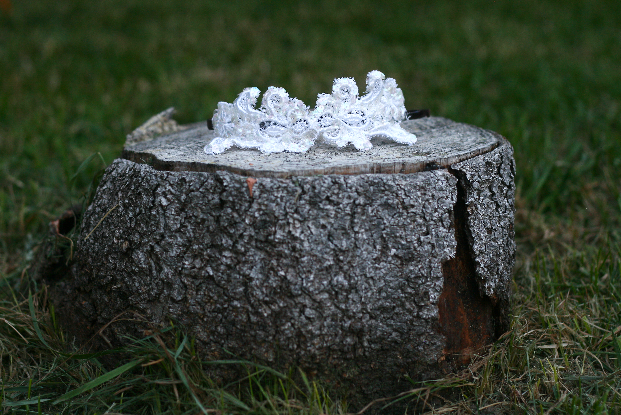 What girl doesn’t want to feel like a true Princess on her wedding day? I wondered why she didn’t keep this dress and what made her donate it, maybe she has passed on to the next life and her children donated it, or she was just de-cluttering. Either way, I hope she would be happy with what I did with the dress and wouldn’t be too sad. I honestly felt like I should have a moment of silence to pay respect to the dress and the lady that wore it, So I did. For real. I am such a dork. 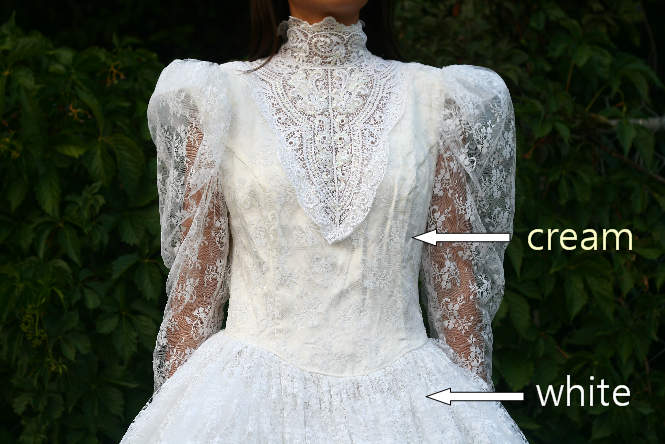 The lining underneath the lace bodice is cream while the lace is white so I dyed the whole dress to a cream color to match the bodice. 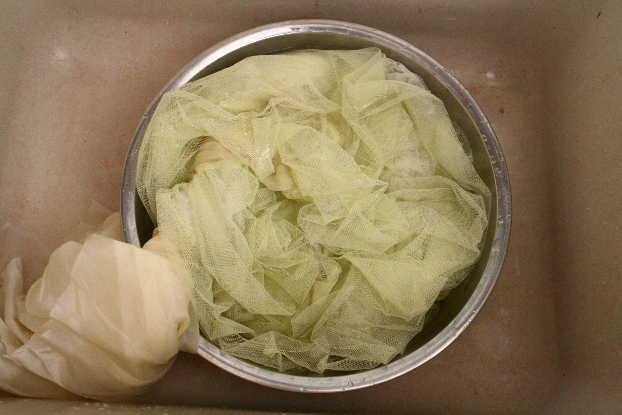 Then while the lace dyed to a beautiful cream color, the tulle got more yellow than I had wanted so I just ended up cutting off the tulle. 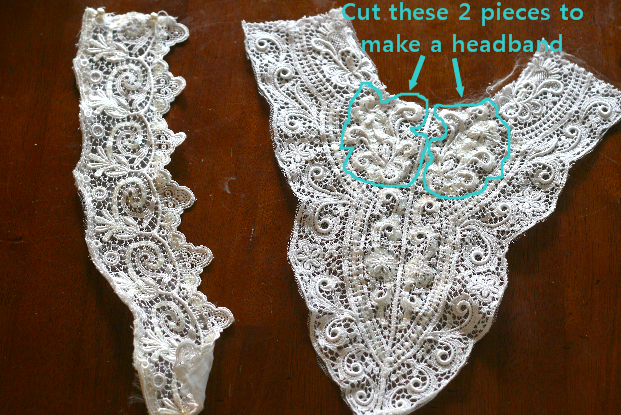 I don”t like any fabric go to waste, especially lace! 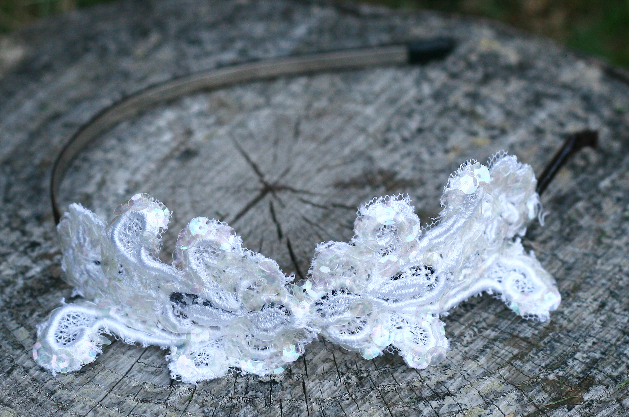 I knew I wanted to do something with the leftover lace I cut off and after looking at the lace designs, these two designs caught my attention and I instantly thought of a headband to make. It’s hard to catch the true color of light colored lace, but the lace color turned out to be a gorgeous cream, ivory color. I did A LOT to this dress, I dyed it to cream so the whole dress would be the same color, I raised the waist line so it wouldn’t be like a v-shape waist-line, cut off all the tulle, cut the length of the dress to right below the knee-length, took off the lace collar, lace-bib, cut off the lace cuffs and cut off the sleeves and made it smaller and shorter length, took in an inch from each side of the dress, cut off the train and the giant bow in the back and gathered the extra lace from the sides to add to the back. 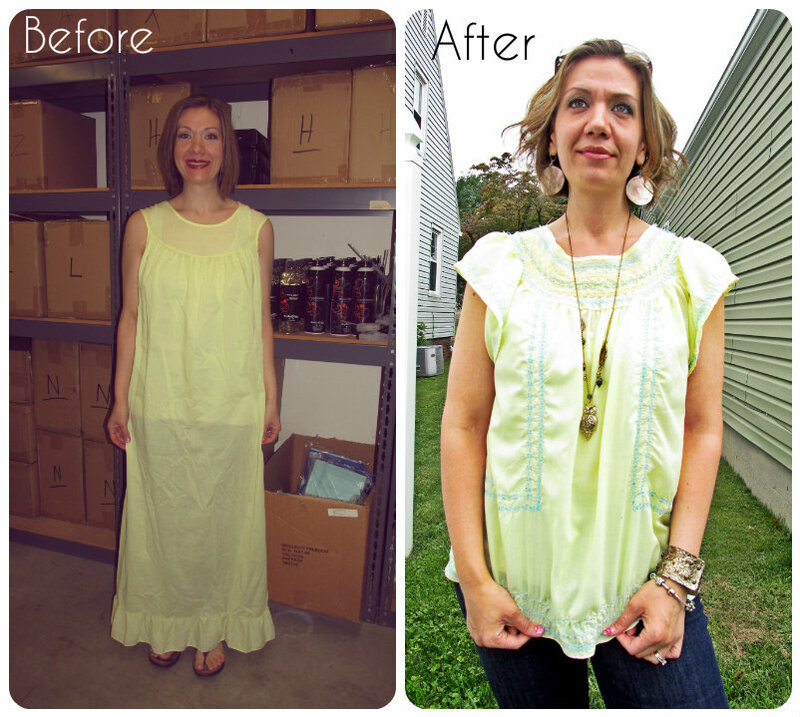 Ok, now it’s your turn to vote for your favorite Boho Chic Refashion. After you click on your favorite, be sure to go to the bottom of the poll and click vote, so your vote will be counted. Have fun! The winner will be announced next Saturday morning. 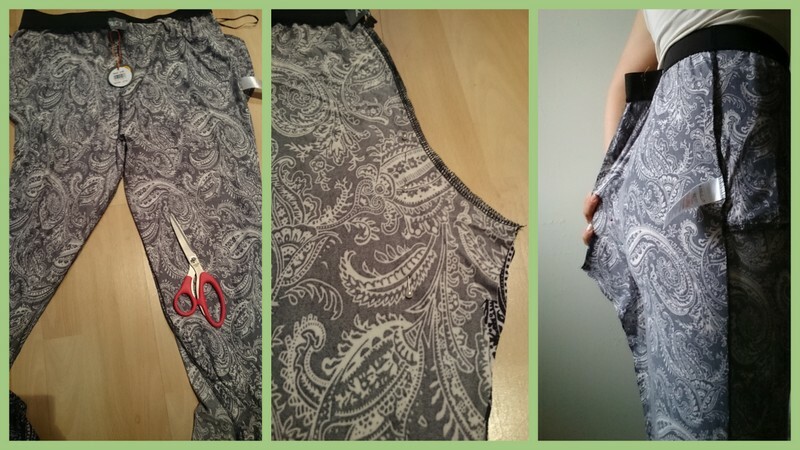 This entry was posted in Uncategorized and tagged alterations, Boho Chic, clothing, DIY, fashion, reconstructed clothing, Refashion, Refashion Runway, Sewing, upcycling. Bookmark the permalink. I can’t fine the poll….am I going blind! It’s in the black box right above the comment section. Please ignore! For some reason the poll didn’t show up on wordpress reader. Either way everyone did an amazing job! And what awesome charity shop finds as well! Kara’s is fantastic! The boho style is the most apparent and she made it beautiful. I fee like her project is totally in style. She’s got my vote this week. As usual Gemma knocked it out of the park. I loved them all. This will be a difficult decision! Hello everyone, thank you so much for your sweet comments! I’ve noticed some of the comments and I’m somewhat perplexed by some comments saying my dress isn’t boho? When I googled “boho-chic dress” on Google, most of the pictures were of a lace dress. I thought lace was the epitome of a bohemian style, am I wrong? I believed I was following the challenge and the theme 100% when making this dress. I wouldn’t make something that I know would get docked points for not following the challenge. Anyway, I’m so honored to be in this competition among such talented ladies, I was blown away by the others’ refashions this week! Your dress is stunning! 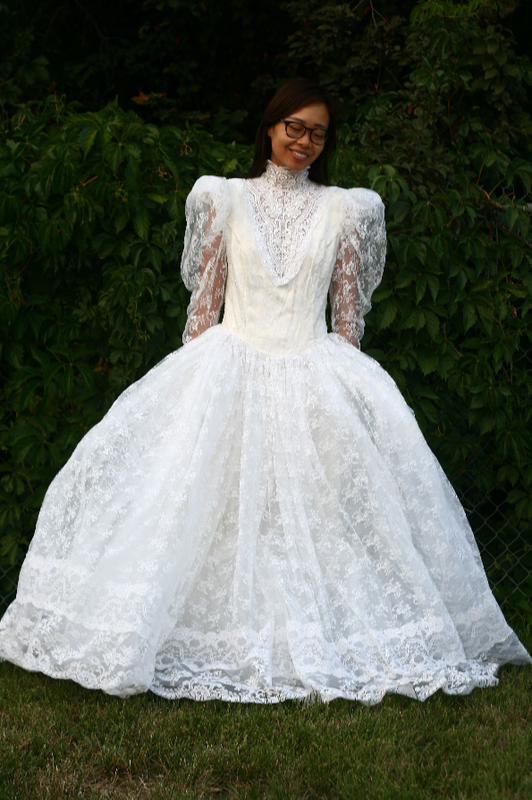 I would never have thought to do that with an 80s wedding dress. now I will look at them differently in the op shops. I just googled the same thing and got the same result. then again without the word “Chic” and got a very different result. I suspect it is a difference between those who lived through the original era (which wasn’t called Boho in the day) and the revisionist way that it is emulated and updated for now. Thank you so much Deidre for your comment! I really do think it’s the difference between the era, I looked into it and researched it a lot(after many people saying mine was not boho-chic) and boho-chic is the modernized version of bohemian, therefore the word “chic” added to it, and not the same style as back in the day. But I am afraid many people think of it as the original style from the era and I won’t get their vote. 😦 So your comment is very much appreciated, thank you! Well – THIS was a very hard decision! I lived through the original Boho period – one of the ladies (the one I voted for) rocked it – I saw Stevie Nicks wear something just like it before a concert in the late 70’s! This was the hardest one to choose yet. Went with Kara because I liked it the best – but they are all so well done and show great creativity and skill. So creative, it brought chills to my arms, or was that envy? Kara’s creation was wonderful and I really enjoyed the backstory to it. Definition of boho-chic: “It’s street fashion of The Village in NYC but coupled with Vintage and a little Hippie and Gypsy thrown in for that added touch. You know when you see it. It’s got a 70’s flair to it-very Retro. 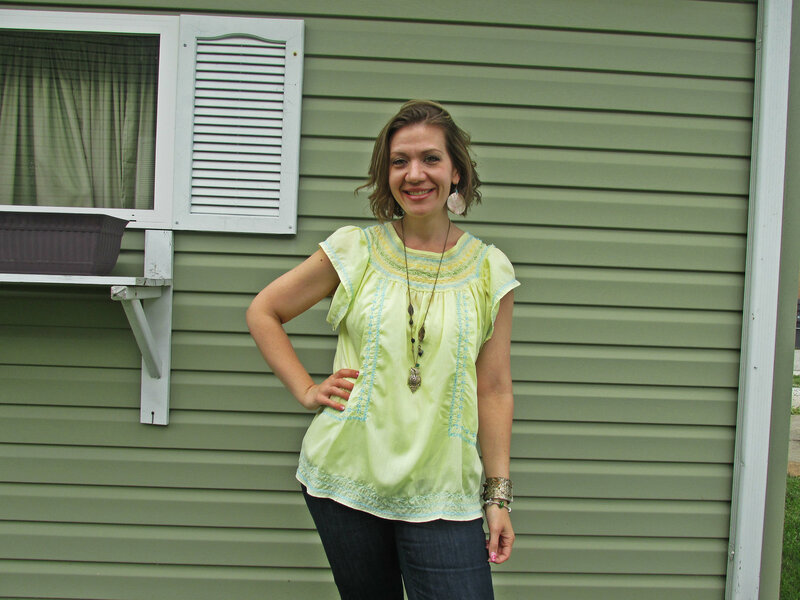 A fashion trend that is part bohemian and part chic. It is tied to the vintage phenomenom in fashion where the trend was to bring back vintage styles for the modern era. 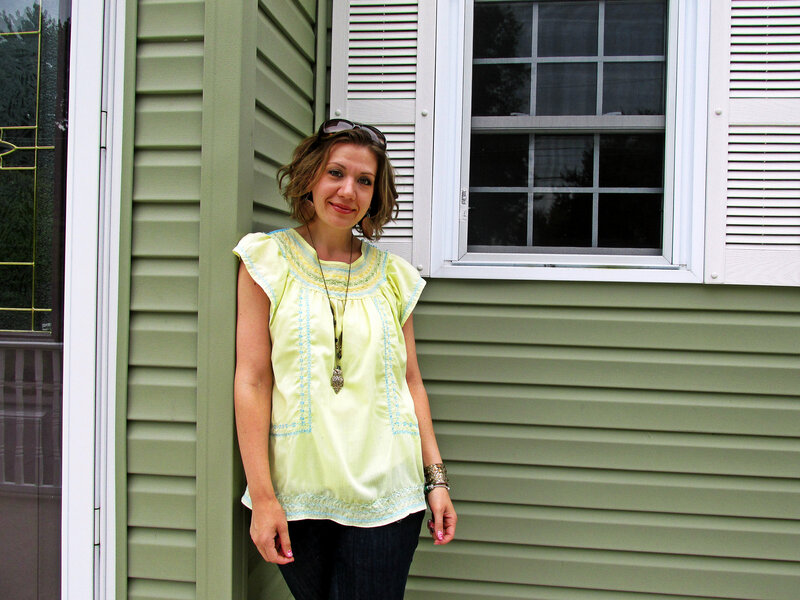 Boho chic combines organic, colorful, detailed, folk-inspired pieces with simple, modern pieces. 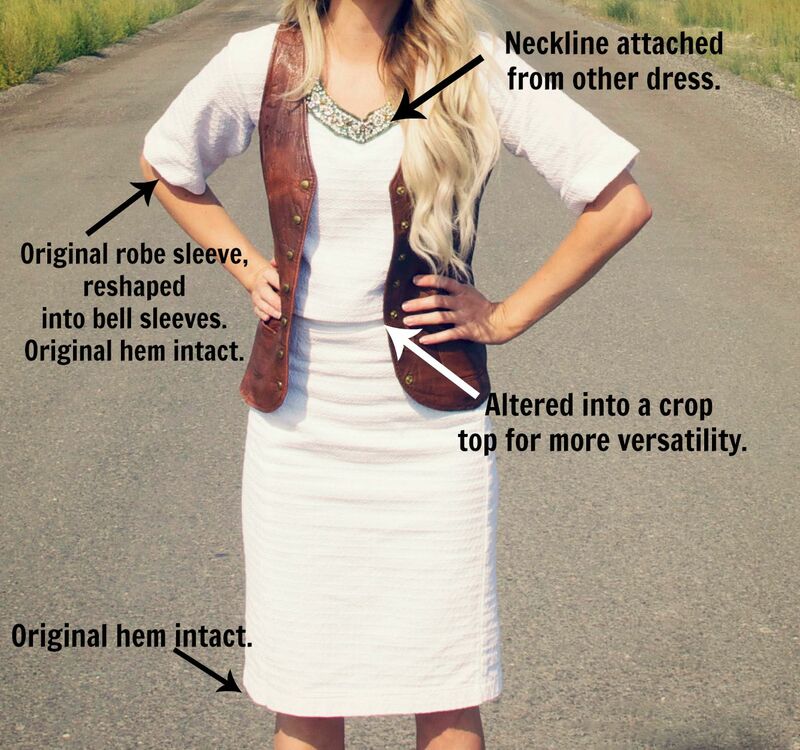 An example would be wearing a beaded peasant dress with a white tanktop. 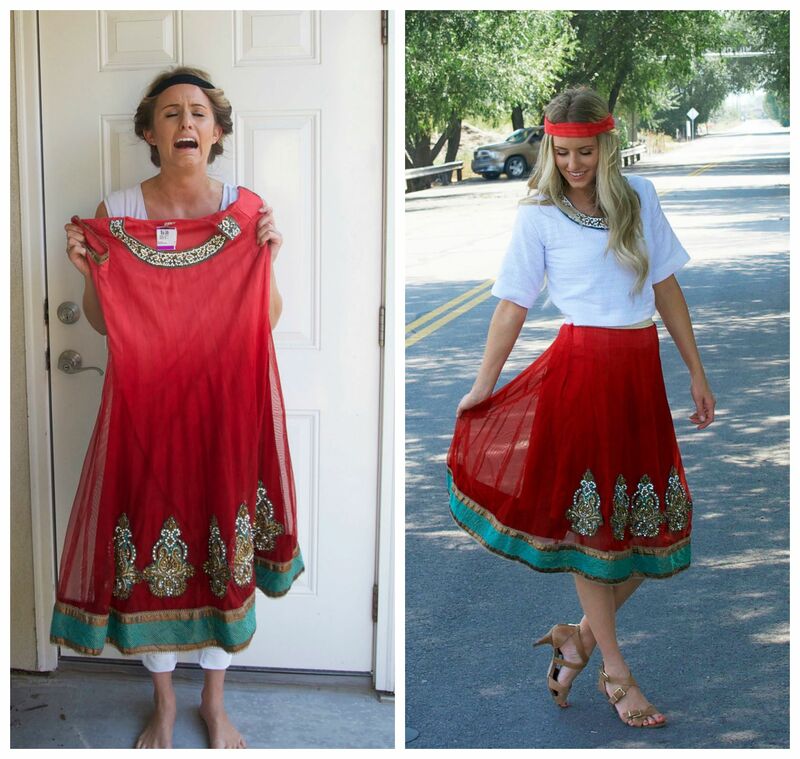 I think Sarah nailed the boho-chic refashion! 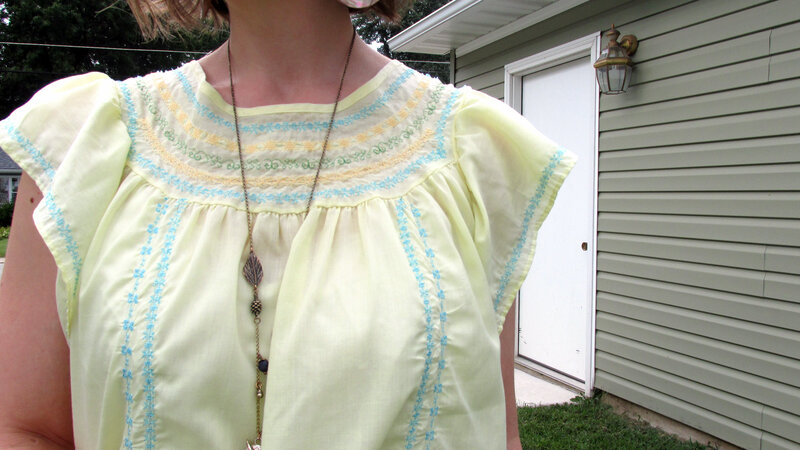 Vintage, lace, retro, it’s very bohemian. While the other ones are impressive, I feel Sarah’s fine detail to that perfect fit and articulate sewing skills shine through in each of her refashions that triumphs over other constestants craftsmanship that I’ve seen. Good Luck Sarah!!! The dress is beautiful!! They were all awesome and I honestly can’t decide between Gema ( I would totally wear that outfit) and Kara with her not one but two clever outfits…..I’m glad it’s not up to me! Gema! I’m so glad you caught the humor! I just have to say, you are a creative genius! Everything you make puts me in awe. I still can’t believe you made a purse out of a straw hat! As I was trying to come up with a boho idea I actually asked myself, “What awesome thing is Gema going to come up with this week? Maybe she’ll hand crochet a vest using nothing but dental floss!” Seriously though, you could totally do that! 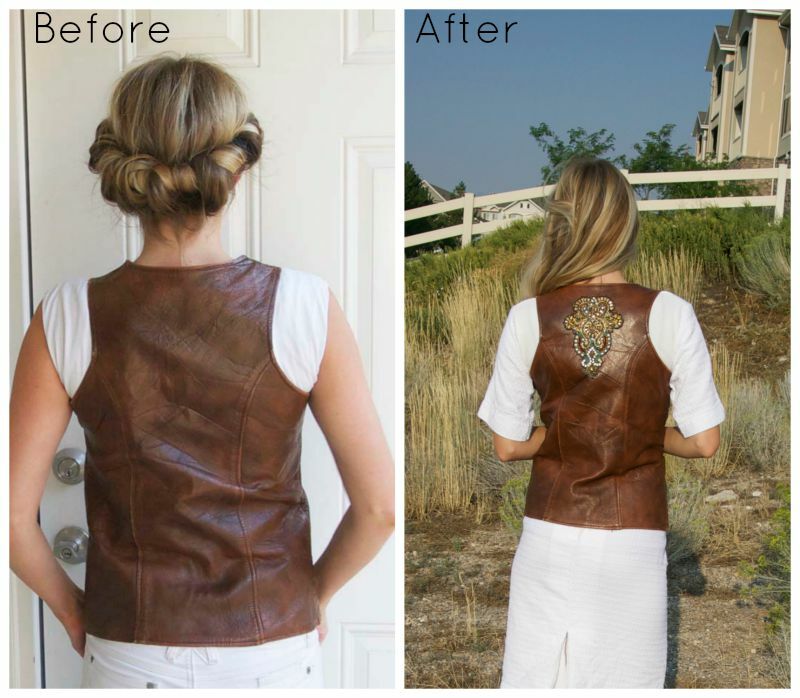 I love your refashion this week, the way the fringe drapes over the vest is so beautiful. You really nailed it. I’m really excited to see what you come up with this week! Kara nailed it as usual, I love Kara! I’ll be voting for her every time😀 I enjoyed Gema’s too. Wow, I love how the contestants mentioned honoring the original pieces they were working with by thinking about the story of the pieces, and the people who owned them. I think the important lesson in that for me was a reminder to “slow down” and be reflective… we are in a society where slashing stuff is just so easy. It is so much easier to destroy something than to build it, and I think that each of the contestants this week showed extreme care, prevision, and skill! Nice job ladies!!! Oops… typing too fast. I meant to say precision, but I guess provision works too! I love what you had to say, Tondra. 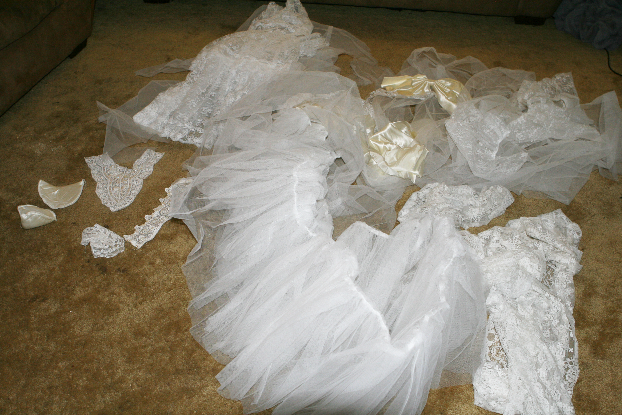 Especially the way Sarah treated that wedding dress. On her blog she even mentions giving it a moment of silence. She is so thoughtful to think of how important that dress was to the original owner and to realize it’s significance in someone’s life. Some of you keep talking about how Sarah’s isn’t boho but if you google bohemian lace, everything that comes up is that beautiful white lace, just like Sarah’s. Lace is the epitome of Boho. Sarah nailed it. They are so great with their style that it makes me confused to decide to choose who is the best! I love this week’s challenge! It has been so much fun seeing what everyone has come up with! I wish I were this good at sewkng! However, I’m a bit confused…while scrolling through everyone’s entries, I noticed that Kara’s creation was very similar to to the longer sleeve crop top and knee-length skirt combo Sarah did about 4 weeks ago? Are contestants able to repeat a design that has already been done? Aside from that, I have loved seeing all the boho chic designs. Keep up the good work ladies! Did you know that Sarah and I are friends in real life? In fact, after I signed on to do Refashion Runway, I texted her the link and told her to apply too. She’s truly amazing and a wonderful person! We actually have more than just sewing in common, we both share the same religious beliefs. As part of our beliefs, we both follow a conservative code of modesty which requires us to cover our shoulders, have our skirts and shorts be at least knee-length, have our midriffs covered, and wear things are aren’t exceedingly low in the front or the back. So while we did both make crop top and a skirt at different points, apart from them both following the same modesty guidelines, they are actually very different. From a seamstresses standpoint: Sarah’s skirt is a child’s size, it is also an A-line, and it’s fitted using an elastic band. Mine is an adult pencil skirt, which is fitted to me using two darts. It has a hidden zipper in the back, a separate waistband, and a kick pleat. Sarah’s crop top buttons in the front and has a separate panel piece over the shoulders. My crop top fits over my head due to the knit fabric in the back, mine also has flared sleeves, and a decorative neckline. While they are both crop tops, it’s important to remember that crop tops are very in fashion right now, so the fact that both of us made them isn’t really anything significant. 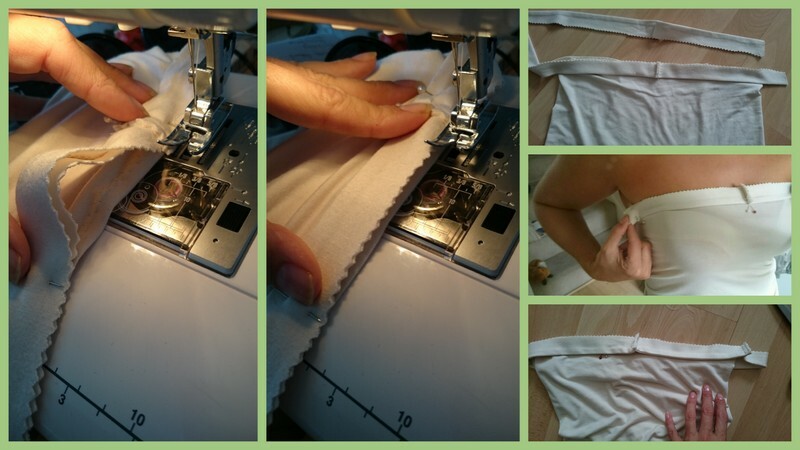 In fact, other contestants have made crop tops during this competition as well, including Laura, The Accidental Seamstress, during her refashion last week. I appreciate your regard for the integrity of this competition, and for looking out for Sarah (I love her too). And I promise I did not copy her design. For most of the refashion I was actually planning on making a dress, but switched to a crop top so I could wear the top with the other skirt I was able to create from the kurti. Boho is long gone from Greenwich Village the modern version is the Brooklyn Hipster. They are alive and kicking. You can still see most of these outfits today walking down the streets of Williamburgh Brooklyn. 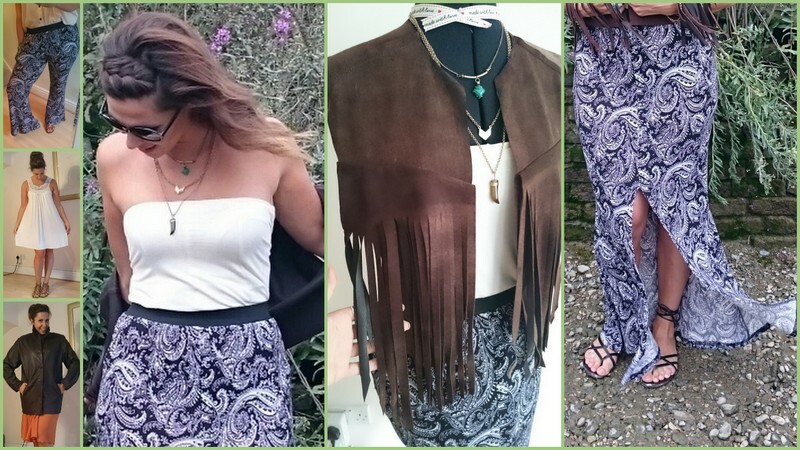 In terms of defining Boho Chic to me those words mean fringe, leather, bell bottoms, paisley prints and crochet lace. 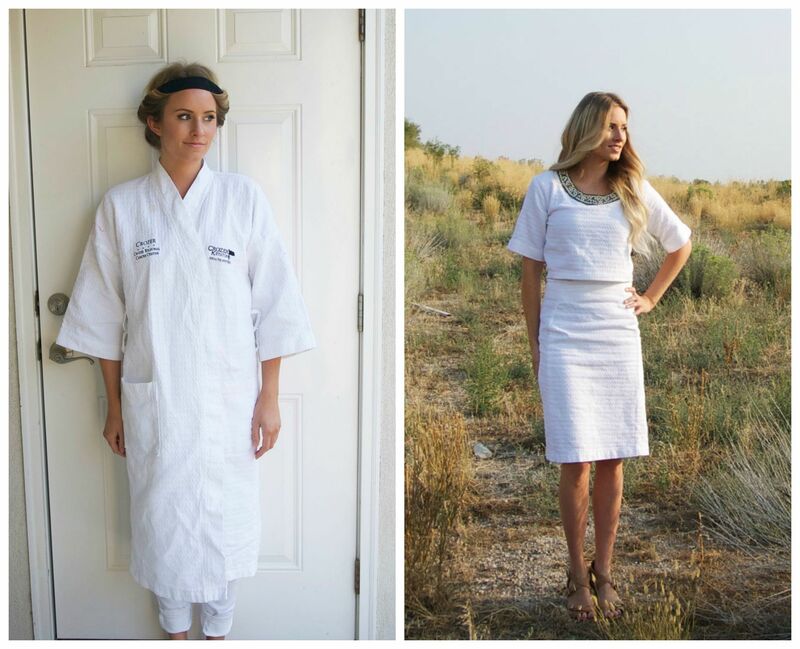 I love both Kara and Sarah’s refashions!! Kara’s is definitely very wearable. And I think the lace in Sarah’s dress is the epitome of boho chic! So amazed at all the talent!! Sandy! What a beautiful way to support both of your friends in the competition! You are the sweetest. I vote for Kara from While Camden Sleeps. Two super cool outfits! 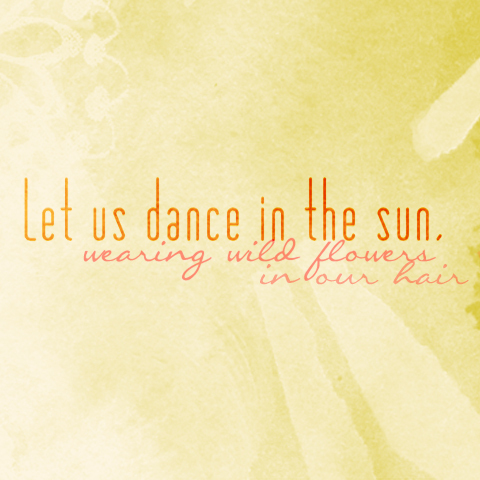 Our Life is Beautiful for the win! Kara’s work looks like beautiful art remastered. Just so cute and trendy!